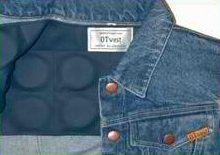 The OTvest™ denim, weighted vest is designed by an occupational therapist who has provided treatment with special needs students (infants through adults) within the public school setting and within their homes, for over 35 years. Nancy VandenBerg, MS, OTR, is a nationally certified occupational therapist, with a Master of Science degree in occupational therapy, Bobath trained (by Berta and Karle Bobath, creators of NDT or Neuro Developmental Treatment*), sensory motor integration and extensive oral-motor therapy experience. She has treated patients in a Detroit psychiatric hospital (Lafayette Clinic), nursing homes, and the Henry Ford Hospital occupational therapy department. Ms. VandenBerg has provided direct OT treatment with over a thousand students, at one time, serving the occupational therapy needs of nine school districts and establishing the first OT school program for that county. Ms. VandenBerg has provided inservice training for school districts, presented at state occupational therapy conferences, autism conferences, ADHD conferences (CHADD) and physical therapy conferences. Presentations have included how to measure the effectiveness of treatment for pediatric occupational therapists, as well as those working in geriatric and psychiatric settings. She has worked closely with special education teachers, physical therapists and speech and language therapists, psychologists, social workers, and families. Ms. VandenBerg was a member of the special services team, diagnosing students with autism, Asperger's syndrome, ADHD, sensory processing disorders, movement disorders, visual perception problems such as those associated with traumatic brain injury, Tourette's syndrome, physical disabilities such as cerebral palsy, spina bifid a, muscular dystrophy, multiple sclerosis, ataxia, and spinal cord injuries. Ms. VandenBerg has been on the steering committee of the Michigan Alliance of School Physical and Occupational Therapists (MASPOT) for six years and is a member of the American Occupational Therapy Association. In the 1990's, Ms. VandenBerg and autism consultants utilized weighted vests in several of the school districts where she provided OT service, as they and other occupational therapists were inspired by Temple Grandin's "Squeeze Machine". Ms. Grandin, Ph.D, shared her experiences as an autistic individual herself, and published her observations of how deep pressure or being hugged or squeezed tightly helped her overcome the oversensitivity of her nervous system, and the effects on animals and college students. So compelling is Ms. Grandin's story, that HBO even made a movie of her life in 2010, with Claire Daines playing Ms. Grandin. Ms. VandenBerg noticed the similarities between autistic children, those with ADHD and sensory processing disorders regarding their sensory response to deep pressure. She wanted to create a method of applying the deep pressure she recommended that teachers apply (pressing down gently and firmly on the student's shoulders) to help students focus and increase attention--discreetly throughout the day and for many needy students in an affordable manner. Teacher's and support staff observed how effective the intervention was, but Ms. VandenBerg wanted to measure the effectiveness statistically. She also wanted to publish information regarding the neurology of deep pressure's effects upon the nervous system (how neurotransmitters make it work). Ms. VandenBerg's research, "The Use of Weighted Vests with Children with Attention Problems", has been published in The American Journal of Occupational Therapy (VandenBerg, 2001)* and in Pediatric Issues in Occupational Therapy: A Compendium of Leading Scholarship, (Royeen, 2004). The children in her research study showed an 18-25% increase in their attention in class while wearing a weighted vest*, with a 95% statistical probability that the increase in attention was created by the use of the weighted vest. Currently, Nancy VandenBerg's research is still frequently cited in literature regarding the use of deep pressure and/or weighted vests for autism treatment, and ADHD treatment, and other applications such as balance problems, and ataxia treatment (over 150 published citations). Inspired by the increase in attention demonstrated in her research, and concerned about her observation of the number of children requiring medication at school for attention problems (1 out of 10 children in the school where her clinic was located), Nancy had the compelling desire to design an even more effective weighted vest--with the correct weight placement and needing less weight to be effective than the few weighted vests on the market in the 1990's. Ms. VandenBerg had instructed teachers to press firmly down on the shoulders of students who struggled with attention. The teachers were amazed at how effective this simple strategy worked to refocus students. Ms. VandenBerg wanted a way to discreetly duplicate this same strategy, for MORE children, MORE frequently throughout the day, and in a cost-effective manner. Nancy wanted a practical way to apply the benefits of deep pressure for students with autism, ADHD, sensory processing disorder, Tourette's Syndrome, and with those with physical challenges, anxiety or stress, oral motor (feeding problems) and speech and language problems with whom she evaluated or provided occupational therapy services. Ms. VandenBerg also observed how stabilizing the trunk benefited the children she treated for oral motor dysfunction to better control swallowing chewing, and reduced stuttering. When used during Speech and Language therapy sessions, the therapists reported an increased effectiveness of therapy sessions because of the increased attention, and often saw reduced stuttering. When working in the home of infants with delayed motor skills, Ms. VandenBerg observed how the use of the OTvest enabled those with excessive arm movements (athetoid) to pick up toys they otherwise were unable to pick up with the weight on the shoulder-girdle area. The OTvest is Ms. VandenBerg's creation (2002)--providing enough weight directly upon the muscle receptors of the wearer's body--across the upper chest and back (not just hanging in pockets or pulling down inside the vest). This weight applied directly to the body has been shown to be highly effective in improving function and attention-to-task. While compression vests are helpful for some, they do not provide the degree of trunk stability that the OTvest provides, and look therapeutic, while the OTvest looks like normal attire and provides calming deep pressure--so are a better fit within the public school setting and for wearers in the community. The OTvest is a design that persons of ALL ages like to wear (children, teens and adults), both girls and boys, women and men. The OTvest is durable enough for schools to use for many, many years (10+ years of daily wear), while applying deep pressure to many throughout the day--meeting Ms. VandenBerg's goals. When first putting the OTvest on, the wearer almost always spontaneously says, "It Feels Good!" Ms. VandenBerg accompanied students to the Cheff Center, a therapeutic riding center, when working with special education classrooms, and makes frequent visits to her niece's Stoneridge Equestrian Center--both of which created interest in the use of the OTvest, weighted vest, for hippo therapy, therapeutic riding, and equine therapy. OTvest™, weighted vests are a means of providing a sensory approach to help preschoolers, young children, teens and adults that have difficulty focusing/calming--such as those with autism, ADHD, sensory processing disorder or sensory integration dysfunction, Tourette's Syndrome (tic reduction), Alzheimer's and traumatic brain injury. The OTvest, because of the weight placement across the upper back and upper chest (shoulder-girdle) is also a useful means of providing trunk stability for conditions such as dystonia, cerebellar ataxia, movement disorders such as Parkinson's, tremors, and athetoid movements seen in cerebral palsy. The deep pressure the OTvest provides serves as a holistic treatment to help calm and reduce stress, anxiety, and panic attacks in those with post traumatic stress syndrome or the restlessness and agitation often accompanying traumatic brain injury, autism, and sensory processing disorder. Ms. VandenBerg has personally utilized the OTvest, denim weighted vest with hundreds of children and adults, and continues to consult with those who could benefit from the application of deep pressure and/or trunk stabilization. The OTvest™ is currently being used in thousands of school districts, psychiatric hospitals, clinics, assisted living centers, hospitals, centers for the visually impaired, and therapy settings throughout the United States and other countries, as well as by individuals for their own needs or those of their children at home and in the community. The OTvest is also used by mental health facilities for calming elderly persons and young persons who become agitated due to sensory issues. The OTvest has been used by professionals as an autism weighted vest and ADHD weighted vest since 2002. The OTvest is the weighted vest recommended by professionals--occupational therapists, physical therapists, speech and language pathologists, and physicians as an autism weighted vest, ADHD weighted vest, ataxia weighted vest, balance vest and for anxiety treatment. *NDT or Neuro Developmental Treatment uses an in-depth knowledge of the human movement system, including the understanding of typical and atypical development, and expertise in analyzing postural control, movement, activity, and participation throughout the lifespan, [in order to] form the basis for examination, evaluation, and intervention. Therapeutic handling, used during evaluation and intervention, consists of a dynamic reciprocal interaction between the client and therapist for activating optimal sensorimotor processing, task performance, and skill acquisition to enable participation in meaningful activities.